Jane Eyre 1973 Available for Pre-Order in the U.S.
Well, last week I emailed BBC America. They informed me that they have no plans to release Tenant of Wildfell Hall, although it has recently been released on DVD in the UK. As for my questions about the release of Jane Eyre with Sorcha Cusack and Michael Jayston they said nothing at all. Ah well, Thisbeciel has come through for us once again! Jane Eyre 1973 can now be pre-ordered from this American website. The American release date is: June 27, 2006 . They also have a link for Canadian customers. Jane Eyre is the moving story of an unwanted orphan girl in mid-19th century England , her spirited fight against adversity and her search for love and happiness in a harsh, class-ridden society. 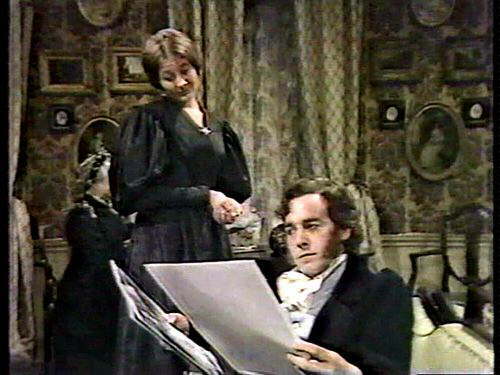 Stars Sorcha Cusack (The Real Charlotte) as Jane and Michael Jayston (Tinker, Tailor, Soldier, Spy) as Mr. Rochester in the best-loved BBC adaptation of Charlotte Brontë’s masterpiece. And if you don't believe it is best-loved… why, just look here, here, here, and here… and well… this very blog! And you must remember that it hasn't been seen for more than 30 years in most places. I personally cannot wait to see the production in full! The price might drop- I see that the BBC lowered their price for the DVD 3 pounds in one week. Let the stampede begin, for all of you Britishers- ">pre-order the DVD from the BBC here. The rest of us will now look on broodingly until it comes out in region one. I would like to remind those who will likely be disturbed by the delay that from the start we had assurances that it will be coming out in region one, so never fear. I have emailed BBC America this morning, hoping to hear news of when it will be available here as well as Tenant of Wildfell Hall which is still unavailable in region one. 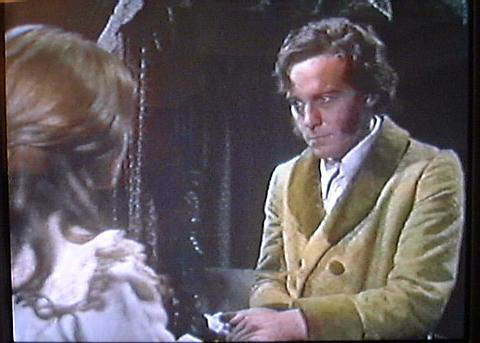 Starring Sorcha Cusack (Tame) and Michael Jayston (Flesh And Blood), this 1973 BBC television adaption of the classics novel follows the fortunes of heroine Jane Eyre who begins her life as an orphan without a penny to her name. Jane Eyre is a poor orphan, brought up by a wealthy Aunt who is determined she should never forget her impoverished background. Surviving the cruelty of an oppressive boarding school, she becomes the governess of Thornfield Hall, owned by the enigmatic and rarely seen Mr Rochester. When Jane finally meets Mr Rochester in the flesh, she is consumed by an overwhelming attraction towards him that soon becomes mutual, however, their hopes for happiness will soon be jeopardized by a terrible secret. 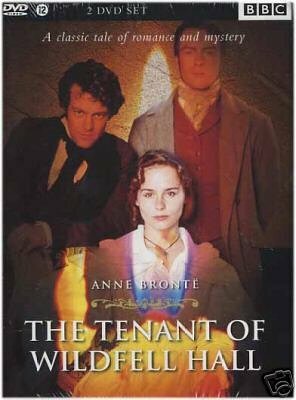 Drink with the Brontes, and a Review of Tenant (1996). Here's a cute little gift idea. Penguin Books has a line of mugs designed after the covers of their original 1935 series of classics. Two of these titles are Wuthering Heights and Jane Eyre. They also have lawn chairs and other things if mugs don't appeal. The Tenant of Wildfell Hall stands apart from the other adaptations of Bronte novels to film. Why? Because it remains true to Anne's original novel. The words uttered by the cast are very close to those of her book and this is an admirable thing because only one other film version of a Bronte novel has been this accurate and particular in following their works and this was a BBC version of Jane Eyre produced in 1983. But despite great performances that film had weak production and an unimpressive lighting and set design. The Tenant of Wildfell Hall is by far the most atmospheric attempt made by any filmmaker who has tried to capture the essence of what the Bronte's conveyed in their brilliant novels. It is the one film adaptation that isn't afraid to be as gritty and harsh as the rocky moors that the novel was conceived among. The performance by Tara Fitzgerald as Helen is absolutely brilliant and I'm sure Anne Bronte would have approved of her work in the film. Fitzgerald refused to wear any makeup whatsoever because she wanted it to look as authentic as possible and it does. There are no people with luminous skin and elaborate hairstyles. (This is definately not a frilly, go find a husband, Jane Austen type production.) This film is far more beleivable considering the time and area for which it takes place. Tara Fitzgerald plays her Helen as one who is stoic and stubborn, all the while knowing that goodness, faith and truth will be her guide and her savior through the dimmest days. Fitzgerald never wavers for a second. She IS Helen from the first frame to the last and her determination in staying true to what was written is very admirable. The other two leads in the film are equally as awesome, that of her farmer and 'good guy' friend Gilbert Markham played by Toby Stephens and the tormented and brutal Arthur Huntington played by the 'great at being morose' Rupert Graves. His name says it all and he is completely believable as the husband who has succumbed to adultery and alcohol. Graves plays Arthur with a tense, always thinking, always full of unrest, state of mind. The kind which Anne Bronte was trying to evoke. He pulls this off to perfection every second his face on the screen. No one could have been better in this role. Even Arthur Jr. played by Jackson Leach is brilliant as the impressionable but otherwise happy child who is trying to make sense of all that has transpired around him. Leach never hams it up or gets overtly emotional for the 'big scenes'. He is just completely natural with his portrayal and registers very well as the child. The Direction by Mike Barker is remarkable. He is equipped with great camera methods that serve to enhance the film's aura. In moments of fear his camera spins round like a top out of control. When there are moments of isolation, Barker's camera is far and distant as though he wants us to see Helen's seclusion in all it's wide open sadness. When there are moments of great anger the camera pans back and hovers behind solitary objects, just watching in silence. There is a difficult task for this film when it has to follow the novel's flashbacks to when Helen was first married and trials she underwent. These scenes are painstakingly placed within the present day storyline. Just like the book, they are a bit shakey to follow at times but in the end it all succeeds. As we prepare for the new year, it seems that more than a few people are turning their attention to the Brontes, in particular to Jane Eyre but also Wuthering Heights. Several bookish bloggers have prepared, instead of a list of resolutions for the new year, a reading list. Several of these include JE and WH. 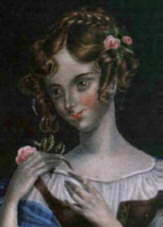 Others have chalked up the Brontes on their list of books read in 2005. Still others take this liminal time to reflect on change, and this brings to mind Charlotte Bronte's Jane Eyre. I can certainly see why the novel would be fit for such reflection although it had never occurred to me before. Although many many people are apt to forget it, JE is not only a romance. I recomend reading Eva's post, New Year, New Meaning? Also, we should not forget that there is quite a lot for us to look forward to in the new year! –A possible new BBC adaptation of Jane Eyre starts production? –Release after more than thirty years of the BBC's 1973 version of Jane Eyre. –Release of Anne Bronte's Tenant of Wildfell Hall on DVD. –Biopic 'Bronte' possibly to begin production? Jane Eyre 1973 Released May 8th, 2006? First Tenant of Wildfell Hall, and now this! More news on the up coming release of the BBC's 1973 mini-series of Jane Eyre starring Sorcha Cusack and Michael Jayston. As previously reported on Brontëana, the 5 part mini-series is reportedly to be released by Acorn Media sometime in 2006. Now we have a date! It looks like 2006 will be a very good year for Brontëana- May for Jane Eyre, March for Tenant! Maybe the silent version of Wuthering Heights that the Brontë Parsonage is looking for will turn up as well, and perhaps Brontë will begin filming! ETA: Just in, some new hints regarding this 'new' film of Jane Eyre mentioned in passing by Newsweek in an article about period films. I had written to the editor to confirm his information regarding this production but have recieved no reply. Brontëblog has been able to turn up the CV of the director of what appears to be a new BBC production slated for production in 2006. The writer is Sandy Welch, the producer is Diederick Santer. Many thanks to Sarah Barrett for the news! Anne Brontë's Tenant of Wildfell Hall will soon be out on DVD at last! Details on the region 2 DVD can be found here. This is indeed the 1996 version with Tara Fitzgerald as Helen Graham. Release date: March 13, 2006. Not yet available: you may still order this title. We will dispatch it to you when it is released by the studio. Synopsis: Based on a little known 1848 novel by Anne Bronte, Tara Fitzgerald stars as an enigmatic young woman who moves to 19th Century Yorkshire with a young son. Distancing herself from everyone in the village and their prying questions, she remains totally aloof until a charming neighbor farmer gets her to reveal her past through his persistence. Only then does she reveal she is hiding away from a womanizing, belittling husband. – This three-part BBC adaptation of author Anne Brontë's novel The Tenant of Wildfell Hall features Tara Fitzgerald as Helen Graham, a pensive woman seeking a way out of her miserable marriage to Arthur Huntingdon (Rupert Graves), a rakish alcoholic who tricked Helen into marrying him before his bad behavior became outwardly evident. Meanwhile, farmer Gilbert Markham (Toby Stephens) becomes increasingly attracted to Helen, whom he is led to believe is a widow.